According to promotional giants Top Rank, ticket sales for the ring return of the son of Culiacan, Sinaloa, Mexico’s favorite son have been highly successful and a raucous crowd is to be expected on Saturday night. 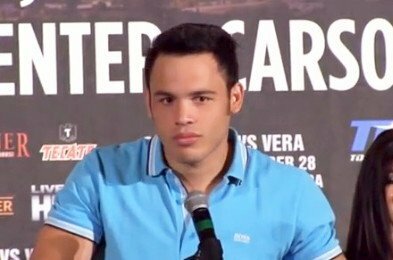 Julio Cesar Chavez, Jr. is now back from his one year hiatus, only now the former WBC middleweight champion is no longer a middleweight. As is such, Chavez’s opponent, Austin, Texas native Brian Vera is now in the middle of a wait himself. Weight, poundage and mass are among the choicest words to accurately describe the grappling of the girth that Chavez, Jr. has so famously as well as publically battled. To be fair, many of us aren’t as slim and trim as we’d prefer, yet even more of us are not handsomely paid professional athletes. The contracted weight for this Saturday’s bout in Carson, California was originally contracted at 168 pounds, yet rumblings emerged that the mark had been raised up another five pounds to 173. Does this shock, move or at the very least surprise anyone? It’s clearly not Vera who will have the potential for a weight dilemma, yet it’s not the central Texas fighter known as “The Warrior” who is being counted upon to sell out the StubHub Center. Matters will fall (or weigh) as they may, according to Top Rank President, Bob Arum. “We’ll look at what they (Chavez, Jr. and Vera) weigh tomorrow and decide what the weight limit will be. I’ve talked with Vera’s promoter, Artie Pelullo and we’re having breakfast tomorrow morning to discuss the weight issues. I know what Julio, Sr. said, but I do believe that he misspoke”, said Arum during a media conference call yesterday afternoon. Granted, the main event on Saturday evening will be televised on HBO’s “World Championship Boxing”, yet there is not a title at stake during the split-site telecast. Sharing the bill from another location (Canada) will be Tavoris Cloud and Adonis Stevenson. That particular bout is for a light heavyweight title. Speaking of, will this be where Julio, Jr. ultimately ends up? It’s certainly a possibility, but where will the shenanigans end? Is this a contracted weight agreement that can be tuned just like an old car radio? For those of us with an ear close enough to boxing and beyond the Mayweathers and Pacquiaos of the sweet science, such behavior is nothing new. There is a standard of excellence that is expectedly placed upon professional prize fighters and for some reason Julio Cesar Chavez, Jr. may consider himself exempt from such standards. If it wasn’t the weight, then it was the weed. Via scruples or scripting, Chavez, Jr. seemed to take the blame for his actions. I wrote about Chavez’s bongocious habits last year after his memorable fight with Sergio Martinez. He was fined. He was suspended. Who cares if he smokes, tokes and damn near chokes? Still, the rules are as clear and clean as the pipe screen. The best thing about the potential legalization of marijuana would hopefully be the end to the senseless bloodlust and killings that have crippled Mexico. Regardless, whatever caused Freddie Roach to walk away from who he claimed to display the attitude of a spoiled and lazy kid is enough of a hint to expect a huge version of the offspring of Mexico’s greatest ever. It’s likely difficult to envision setbacks as devastating when the proverbial “something to fall back on” is a soft landing. There are more than just pockets of poverty in Mexico and we’d have to ask Julio’s dad to tell us about that topic. Brian Vera’s best hope may be to bring the action straight to Julio and test his level of readiness. Who knows? There will be the multitudes of red headbands once again in favor of Chavez, just as they recently have been for Mexico’s other cash kid, Saul “Canelo” Alvarez. The unfortunate thought is that there are actually waves of potential greats coming out of the land of the TriColor besides those two gentlemen. So, let’s just see what unfolds on Saturday night. We’ll see if the rough and ready Julio shows up or if the offshoot of Narcissus walks to the ring. We all know what happened to him. He fell into the lake, but Chavez, Jr. would likely survive because he’d be able to float.